Send OnPolicyUpdate to SDL if it is required to get Policy Table Update (by any specific HMI workflow reason). HMI should send SDL.OnPolicyUpdate in case the new PT Snapshot is required from PoliciesManager. Currently this notification is not used in any HMI workflows, but in case of necessity, HMI may use OnPolicyUpdate for getting the newest Snapshot (for example, during retry sequence or by user request). SDL ignores all invalid notifications which come from HMI (invalid JSON, invalid data types/bounds etc). 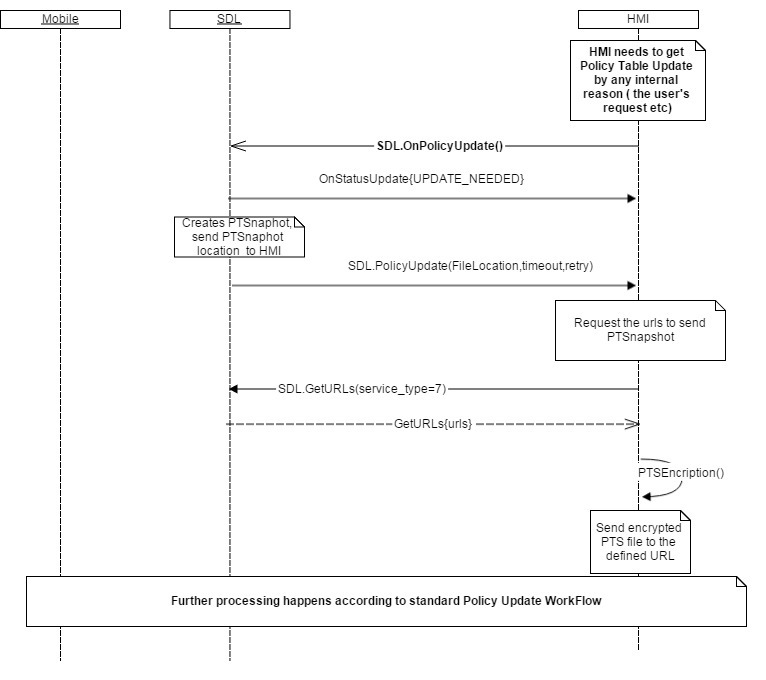 In case SDL receives SDL.OnPolicyUpdate notification from HMI, SDL PoliciesManager must start the procedure of Policy Table Update (that is, create PT Snapshot, send it to HMI for encryption, and etc. what is defined by related requirements). This RPC has no additional parameter requirements.